Join us the second Thursday of each month for to watch anime, discuss manga, learn about Japanese culture, and more. For teens in grades 7-12. Cosplay is optional. New members are always welcome. There is no need to register: you can just show up. Liz Miller of the Crawford Soil and Water Conservation will bring us this informative presentation. Both rural and urban dwellers can create a nature oasis right where you live. The program is free, but we have limited capacity, and registration is required. Please come to the main desk or call to register. Mon, Jun 3rd, 6-7pm. The Crawford Park District will present a program about geology. Registration is required. Registration opens Thursday, June 13th. Call the library or stop by the Children's Room to sign up. Wed, Jun 19th at 2pm and Wed, Jun 19th at 6pm. Shizzle Dizzle Magic of Mansfield will present a 45-minute show. Registration is required. Registration opens on Thursday the 20th. Call the library or stop by the Children's Room to sign up. Wed, Jun 26th at 2pm and Wed, Jun 26th at 6pm. Mike Hemmelgarn, comedy juggler and ventriloquist, will perform. Registration is required. Registration opens Thursday, June 27th. Call the library or stop by the Children's Room to sign up. Wed, Jul 3rd at 2pm and Wed, Jul 3rd at 6pm. Come learn amazing bug facts and view live bugs. Registration is required. Registration opens Friday, July 5th. Call the library or stop by the Children's Room to sign up. Wed, Jul 10th at 2pm and Wed, Jul 10th at 6pm. 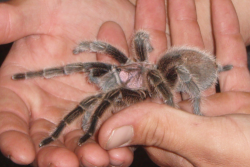 Featuring reptiles, amphibians, and arachnids. Registration is required. Registration opens Thursday, July 11th. Call the library or stop by the Children's Room to sign up. Wed, Jul 17th at 6pm. On select Friday afternoons in June and July, drop by the library for fun digging-themed crafts. You don't need to register for these craft days: you can just drop in any time between 3 and 4. Local computer programming expert Jerry Francl will teach you how to use the free Scratch programming environment to uncover your hidden talent for creating digital art for comics and games. Each participant will receive a CD full of sprites to take home. Registration is required. Call or stop by the library to sign up. Mon, Jun 10th at 6pm. Professional photographer Adam Knapp will talk about his work, demonstrate some of the special equipment he uses, and talk about how to get into the field of photography. Adam will also talk about composition and show you how to create better photos with whatever camera or equipment you already have. A question and answer session will follow the presentation, and refreshments will be served. For grades 6-12. Registration is required. Call or stop by the library to sign up. Mon, Jun 24th, 6-8pm. GHS Drama Teacher and acting expert Cheri Laughbaum will introduce you to the art of improvisation in this hands-on workshop. Participants will learn to think quickly, look at the world differently, and improve their confidence. Come find out if you have a hidden talent for quick and creative thinking. Registration is required. Call or stop by the library to sign up. Mon, Jul 8th at 6pm. Artist Jeff Nicholas will teach you how to draw cartoons and how to come up with cool new characters and creative story lines. We will provide the drawing materials. Registration is required. Call or stop by the library to sign up. Mon, Jul 22nd at 6pm. Join us to create a mural of all things underground and beneath the surface . This event takes place during our normal Anime Club meeting time, but you do not need to be a part of the club or have any interest in anime to attend. Registration is not necessary for this event: you can just show up. Thu, Jun 13th, 6:30-8:15pm. Coming some time this summer. Watch this space for more information, or check our Galion Public Library Teen Programs page on Facebook for announcements and reminders, trivia, and the occasional contest. Summer Reading starts June 1st for all ages. Summer reading runs June 1st - July 31st. We'll be giving away hundreds of dollars' worth of gift certificates to local stores and restaurants in our weekly prize drawings. The sooner you sign up, the more chances you have to win. You must be at least 18 years old and out of school to participate. (Otherwise, see Beneath the Surface for teens or Dig Into Reading for children.) Also, you must register for the program if you wish to enter our weekly prize drawings. For each book you read this summer, you fill out a drawing slip and put it into your preferred Prize Drawing box. Weekly drawings will take place each Friday throughout the Ground-Breaking Reads program. The more books you read, the more chances you have to win. Winners will be notified by phone. Participants are eligible for a maximum of two weekly prizes. Tickets not drawn for the weekly prize might still be winners: all tickets submitted over the course of the summer will go into the Grand Prize Drawing. We'll also be hosting a number of special programs during the summer. Watch this page for more details. Our Summer Reading program starts June 1st. Read books, win prizes, and come to our special programs. We'll reward you for reading books... with fabulous prizes. Extra activities and prizes will be provided to those who want to keep digging . Plus, we'll have a special pool party for children who reach the goal of reading 25 days. Summer Reading starts June 1st. Read books, win prizes. After reading an item, teens will fill out a rating form and place it in one of the boxes for the weekly prize drawings. Each week, names will be drawn for two different $10 gift cards for local restaurants and shops, books, iTunes, and more. You may fill out rating forms for as many books as you read, and you can choose which weekly gift-card drawings you wish to enter. All entries will also be saved for the final Grand Prize drawings, which will include a $50 Barnes & Noble gift card. Special Bonus: Teens who come to any of our special summer events for teens, or who volunteer at a children's event, will receive bonus tickets to enter into the weekly drawings. Join us for our annual party on the lawn in celebration of summer reading. We'll have crafts, games, and other fun activities. (If it rains, we will still have indoor activities.) Watch this space for more details. You don't have to register for this program: you can just show up. Wed, Jun 12th, 1-3pm. We're bringing back our popular summer writing series, conducted by Rachel Mendell. Mendell has conducted several well-received events for writers at the library; don't miss out on this opportunity to partake of her literary advice and participate in brain-sharpening exercises. In addition to coffee and sweets (catered by The Candi Bar), each workshop will also feature a door prize for one lucky participant. All participants will take away more confidence and joy in their writing processes. These workshops do require registration, but there is no cost to attend. Sign up at the main desk. The workshops will be held in the Community Room at the library. Bring paper and a pen or pencil. Come meet local young self-published author E.L. Mendell at the final event of our 2013 Adult Summer Reading Program. Mendell will share passages from her YA fantasy novel Eysheus Saga, Book One: Blood River and be available to sign copies of her book. Copies of Mendell's book will be available for purchase. Registration is required for this program. Sat, Jul 20th, 1-3pm. We've started posting pictures from our summer programs in our photo galleries. So far we've got photos of the soil and water conservation program, the Star Wars day, the party on the lawn, and the Crawford Park District program. We'll be posting more summer program photos in August. Bingo for Books is back by popular demand. Join us for fun and games (literally, and also literarily). Win free copies of new books by Dan Brown, Bill O'Reilly, Robyn Carr, Sherryl Woods, and other notable authors. Refreshments will also be served. This event is free, but registration is required. Call or stop by the main desk to sign up. Tue, Aug 6th at 6pm. We've been posting more batches of pictures from our summer programs in our photo galleries. This time we've added photos from the Shizzle Dizzle Magic Show, Mike Hemmelgarn's juggling and variety act, and the teen photography and improv programs. See them all in our photo gallery archive. Participants are invited to come dressed as their favorite Olympian, demigod, or Greek hero. Join us for Percy Jackson trivia, Greek mythology team trivia, creating your own sword and shield for dueling, food, and more. Prizes will be awarded to the trivia winner(s) and for best costumes, including a $10 Cinemark gift card to go see Percy Jackson: Sea of Monsters . Registration is required. Call or stop by the main desk to sign up. Thu, Aug 1st, 6-8pm. Come watch the movie on our big screen. The movie we will show is an animated feature film and is rated PG. Call or stop by the library to sign up and to find out the movie title. Popcorn and punch will be served (but we're fresh out of meatball-making weather machines). Remember to bring your own blanket and pillow. For grades K-6. Sat, Aug 17th at 2pm. Each person may have up to 15 items on hold at a time. Items may be renewed up to 3 times, except for video materials. As before, videos still may only be renewed once. Thanks for your patience and understanding as we implement these changes. Join us Tuesdays at 6:30pm and Wednesdays at 10:30am for stories, songs, crafts, and lots of fun. The Family Story Time on Tuesday evenings feature stories, crafts, songs, and rhymes designed for preschoolers, their parents, and older siblings to share together. The Toddler Story Time on Wednesday mornings are fit for the younger set, but all preschoolers are welcome. 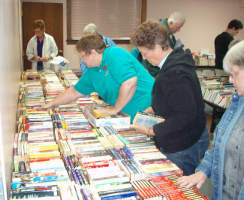 The fall book sale has been scheduled. Watch this space for more details as the dates draw nearer. Thu, Oct 10th, Fri, Oct 11th, and Sat, Oct 12th.